Good news. 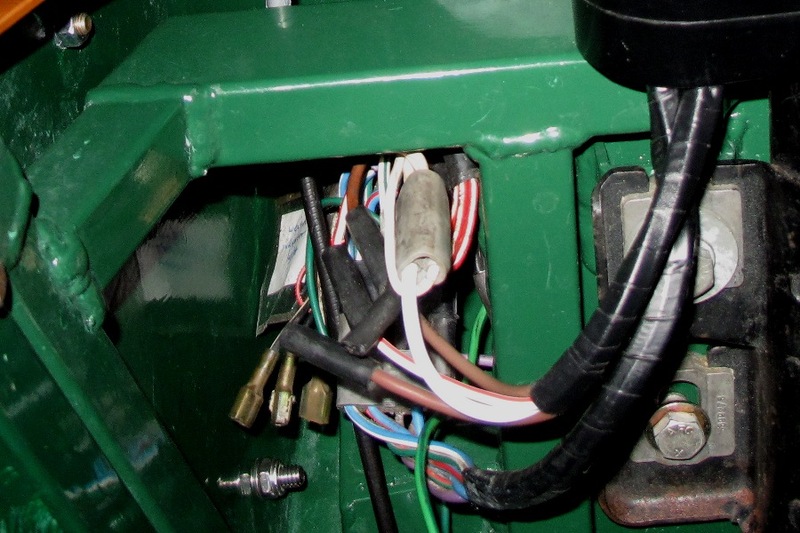 We found the problem that was plaguing our electrical system and temporarily disabled the Locost last week. It wasn't even our fault, depending on how you define fault. 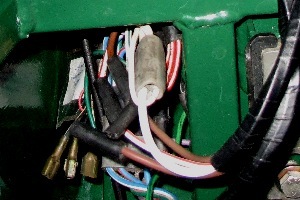 The main power plug on our brand new ignition switch was loose in the six-way connector that supplies power to the tach, ignition light, turn signals, brake lights, and fuel pump. 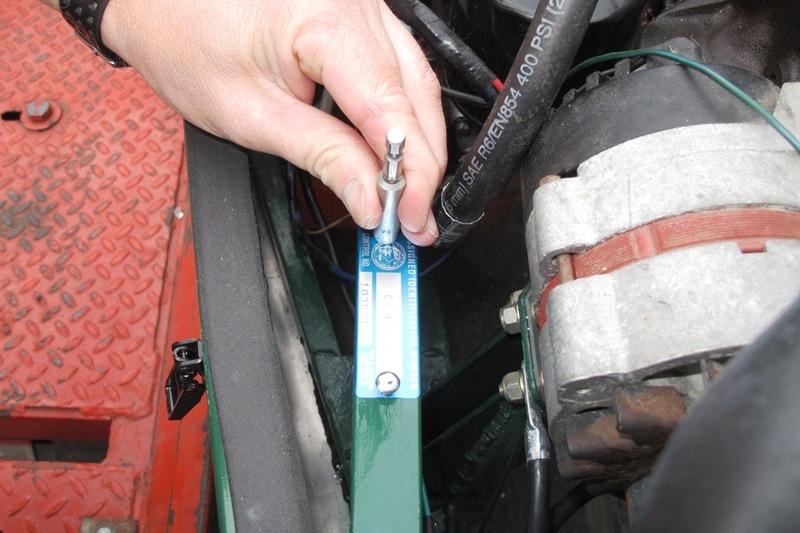 Being loose, the connection was intermittent, and when the car died it wasn't the ignition cutting out, it was fuel getting too low in the carburetor float bowls. We seem to recall that the connector was a bit loose when we first installed the new switch last month, but apparently it didn't bother us enough to do anything about it at the time. It was brand new after all, so it had to work, and besides, we had a lot more pressing things on our minds, like for instance whether or not we'd ever be able to re-install the dashboard. 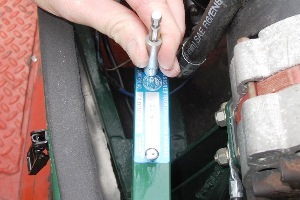 Fortunately the connector is within easy reach under the dash, which will allow us to try something different if crimping the connector with a pair of pliers turns out not to be a permanent repair. So that was good news, but in even better news, we rented a truck and trailer and towed our Locost to the not-so-local office of the California Highway Patrol, and armed with the proper paperwork and identification, convinced the good people there to assign the car a Vehicle Identification Number. So we're now semi-legal. Or not really, but at least we're identified. We didn't have an appointment for the inspection, it was just an open inspection day, so to beat the rush we loaded up the car in the dark and hit the road before sun up. 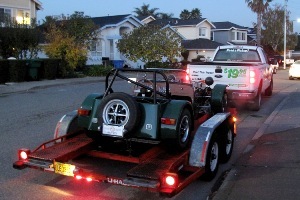 First, though, we had to convince the good folks at U-Haul to rent us a trailer. 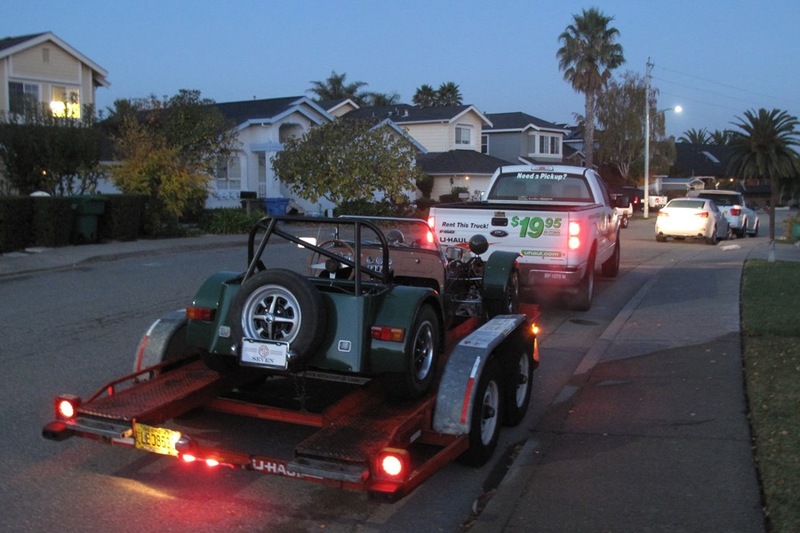 It seems their computerized rental system requires that you tow a recognized automobile, one that has an actual make and model, so that their computers can take that information and decide—based on vehicle weight, track, wheelbase, and maybe color—whether or not your car is worthy of being hauled on one of their trailers. We made the mistake initially of lying about what we had. 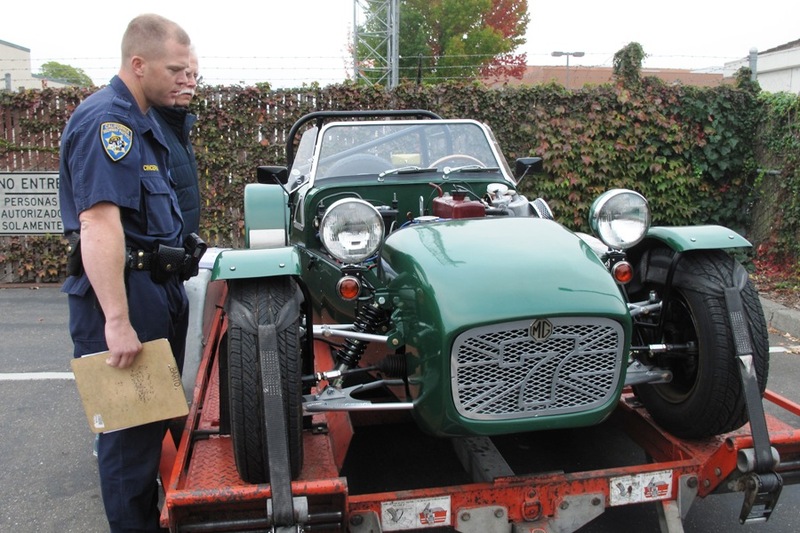 We told them we had a 1972 MGB. Their computers refused to rent us anything. So we called them back, and rather than lie and tell them that we had an MGB, we lied and said we had a Miata. 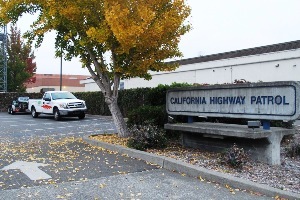 Which wasn't a complete lie, because we do have a Miata, although we're not taking that car anywhere close to a CHP office, at least not until we can get it smogged and get the registration caught up. But that's another story. Right now our only concern is for the Locost. The U-Haul computers were happy to rent us a trailer for the Miata, and the good folks who work there don't need to know anything more than that. Upon arriving at the CHP offices, we pulled the truck and trailer into a small parking lot that had absolutley no room for a truck and trailer. Luckily we were early, and the lot was empty, so we parked crosswise over six regular parking spots. And then more people started showing up, hauling various vehicles including several motorcyles and a sand rail, and pretty soon the lot was full. When the lone CHP officer arrived to start the day-long inspection marathon, he posted a sign-up sheet on the door and we signed in first. Which might've been good or bad, but in our case we were fully prepared for anything. We had photos and receipts for days, the bill of sale for the donor, and a complete parts list describing exactly where we got everything. 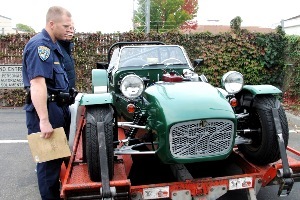 The officer strolled around the car, asked whether we built the frame or bought it, then had us remove the hood. He stood and stared at the engine for a while, frowned, then asked about the frame tube that runs diagonally through the engine bay. Of all our possibly suspect engineering choices, this seemed like an odd one to question. But we patiently described the function of the 1" square 16 gauge tube, apparently to his satisfaction. And so he nodded, picked up our documentation binder, and removed the page containing the pink slip from the donor. He then grabbed our DMV forms and disappeared inside the building. Meanwhile the rest of our fellow VIN seekers wandered aimlessly around the parking lot, nervously waiting their turns, a few stopping by to ask questions about our car. Having observed the process so far, no one quite knew what to expect next. Ten minutes later the officer emerged from the building. In one hand he held our paperwork, in the other a Dewalt drill case. As he approached, we could see attached to one of the pieces of paper a shiny blue metal sticker. He handed us back all of the other papers, then proceeded to drill two holes in the frame tube that runs diagonally through the engine bay. With little fanfare he pasted the shiny blue metal sticker to the tube and punched a couple of rivets through the holes. The crowd cheered. Not really, but I'm sure they were happy for us. So we shook hands with the friendly and helpful officer, replaced the hood, and got out of there with the sun peeking over the hills to the east. Our next step will be to go to the DMV to get the bad news that all of the SPCNS certificates have been issued for 2013, and that we're going to have come back in 2014. Meanwhile, we haven't yet run out of fun projects to keep us busy on the Locost. Work is proceeding well on the hood scoop, and we've also started sewing up our vinyl cover for the trunk. And we're still having a lot of fun driving the car, whenever we can get away with it.